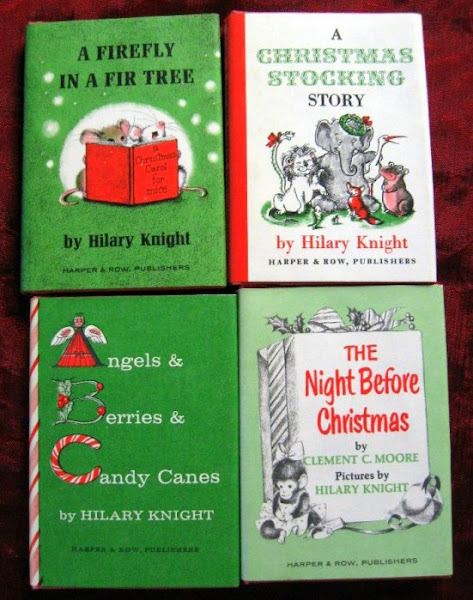 If you called me on the phone tonight and asked me what vintage book you should blow the big bucks on to gift someone for Christmas, hands down, without even the faintest shadow of a doubt, it would be Hilary Knight's Christmas Nutshell Library. 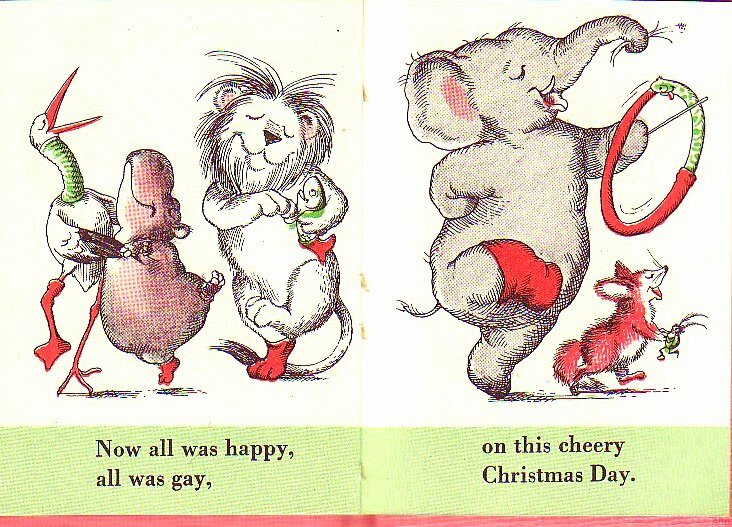 A cousin to Sendak's classic Nutshell Library, this one has the distinct honor of being not only penned by the master illustrator of Eloise, but it's also so unbelievably soaked in adorable that once you have the lot in your hand, it's hard to imagine Christmas without them. 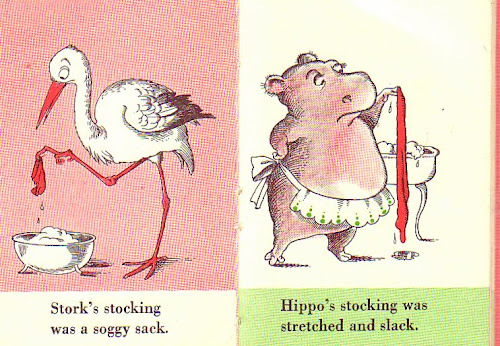 My son refers to them as "the cutest books in the whole world". So, so true. Made up of four teenie, tiny wee darling books ~ A Christmas Stocking Story, A Firefly in a Fir Tree, The Night Before Christmas, and Angels & Berries & Candy Canes ~ the fact that these even exist in the world gives me hope about the goodness of mankind. Have yourself a hyperbole Christmas, why don't you? 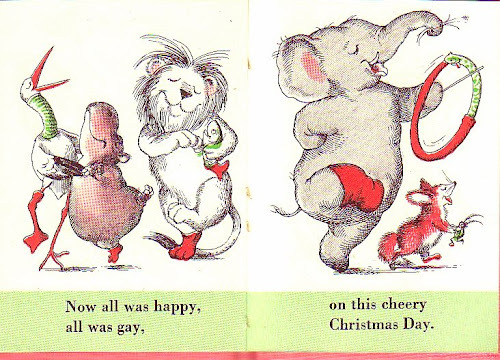 What follows is a Christmas mix-up of huggable proportions... wherein all the animals get their stockings switched in the wash and Santa gifts them all the wrong things. Really, these stories and books morph way beyond cute. 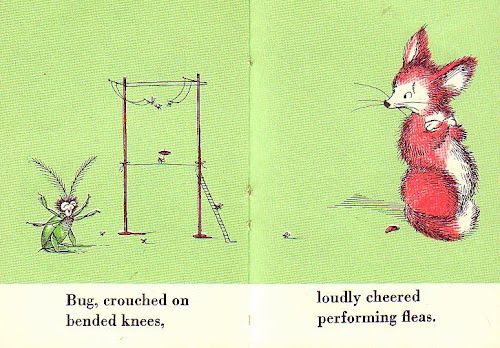 Knight's iconic illustrations. 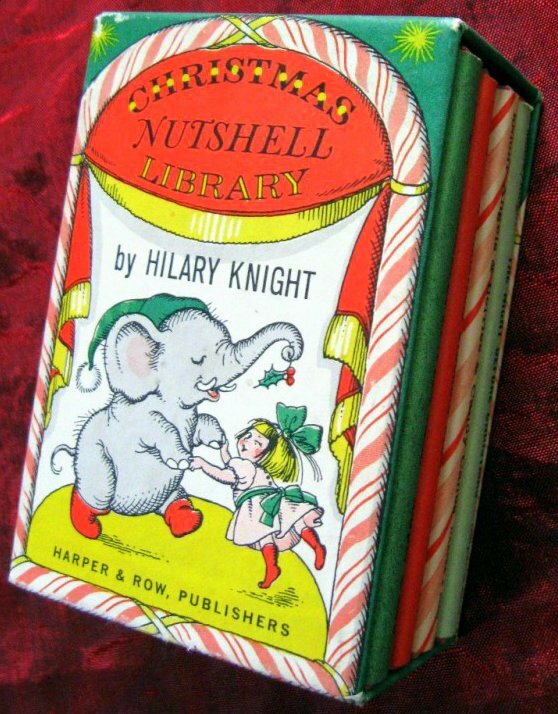 The miniature size with the darling little dust jackets. Absolutely edible! I had to nab pictures of the complete set off an EBay listing ... which by the way is a fine specimen and at $35 with a little more than 24 hours to go, so bid away! Oh my goodness. I didn't know this existed and I want it sooo much. Simply gorgeous. Your post was persuasive; I just snatched up a used set in very good condition on Amazon for $30--via your website. Hurray! These books look marvelous. I feel like you posted this just to make me spend money! No fair! How cute! I gotta have it! 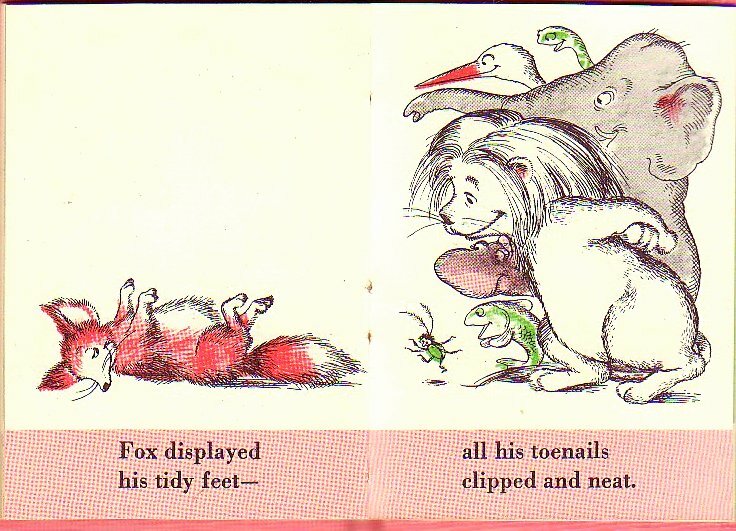 Ooh, I still have my set from childhood, now I want to go re-read them! Love it, thanks for the reminder. 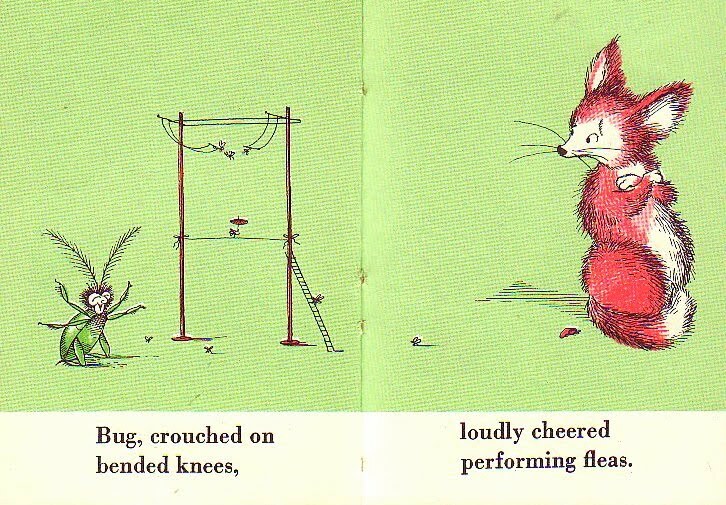 They really are wonderful books. I absolutely love Hilary Knights illustrations. Her people and animals are so so so—something—something wonderful I clearly am not able to put into words! It's so pretty!! I love it!! So very sweet. I believe that I need this. Now. I have the Christmas Nutshell Library ... somewhere. I'm sure it's at my mom's house, buried in a box of Christmas stuff. 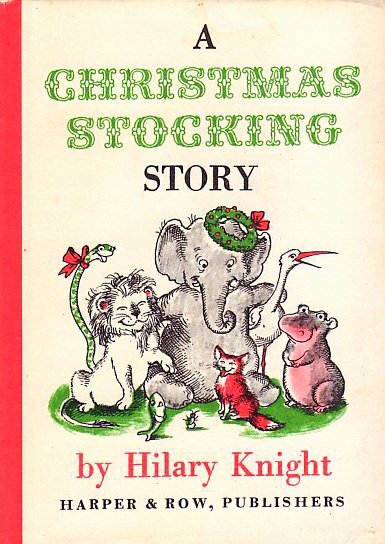 The stocking story came right back to me!